Sea turtles are amazing creatures. Baby sea turtles make a harrowing journey from the beach where they hatch to the safety of deep ocean waters. 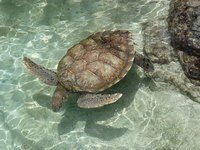 If they survive and aren’t eaten by predators, sea turtles can live to be several hundred years old. To help teach children about sea turtles, engage them with a fun three-dimensional paper craft where they can make their own sea turtle. Use poster board and scrap paper to make a stuffed sea turtle. Use the poster board for all the parts of the turtle’s body. Cut an oval shape out for the belly and a larger oval for the shell. Cut out a small triangle for the tail. Sea turtles have flippers in place of their front legs, so cut out two flippers that are a mirror image of each other. Cut out two more flippers, but make them more rounded at one end--these will be the back feet. Finally cut out a rectangle that is oval shaped on one end to make the head. Cut the head, legs and tail a little long, so that you can staple them to the poster board. Color all the pieces before you assemble them. Staple the legs, tail, and head to the top side of the belly piece. Cut four thin triangles--about 2 inches tall--out of the shell piece. If the shell were a clock, you’d make these cuts at 12, 3, 6 and 9 o’clock. At each cut bring the new edges together and staple them. This will give your shell some dimension. Staple the shell to the belly in several places, but leave an opening. Stuff the turtle shell with shredded paper (or any other stuffing), and then staple the opening closed. This paper sea turtle is perfect for younger children and is a great way to teach them about shapes as well as turtles. Begin by cutting an octagon out of a stiff piece of paper. Decorate it like a sea turtle's shell. Cut a crescent moon shape out of another sheet of paper. The length between the two tips of the moon shape should be just a little longer than one side of the octagon. Cut out a small triangle and four long ovals. Decorate each of these shapes, too. The moon shape is the head. The triangle is the tail. The ovals are the flippers. Cut a 2-inch slit at each of the eight corners of the octagon--each slit should point toward the middle of the shape. Overlap the edges of each slit, and tape them together to make a three-dimensional shell. Then glue, tape or staple the head, flippers and tail to the shell. Glue large goggly eyes onto the head to add a finishing touch. Make a sea turtle hand puppet using paper plates. Use a paper plate for the sea turtle’s belly and one for its shell. Cut a head, two front flippers and two back flippers from construction paper. Color them however you like. Staple or glue the head and flippers to the rim of the belly plate. Then staple the shell plate on top. Staple the two plates together in several places, but leave a gap at the back of the turtle that is big enough for your hand, so you can use your sea turtle as a puppet.